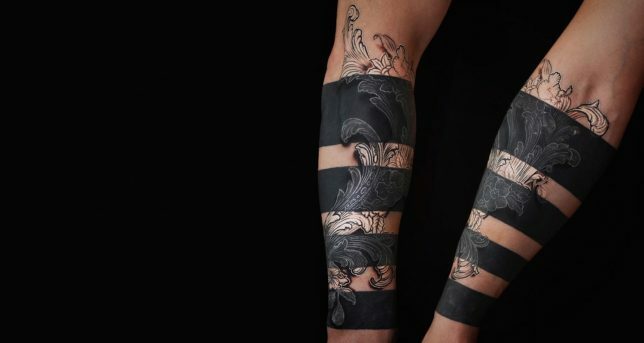 Modern tattoos are less about sailors, pin-ups and ‘MOM’ and more about bold black lines, complex geometry, architecture, esoteric imagery, glitches and even blacking out entire body parts to cover up old work. 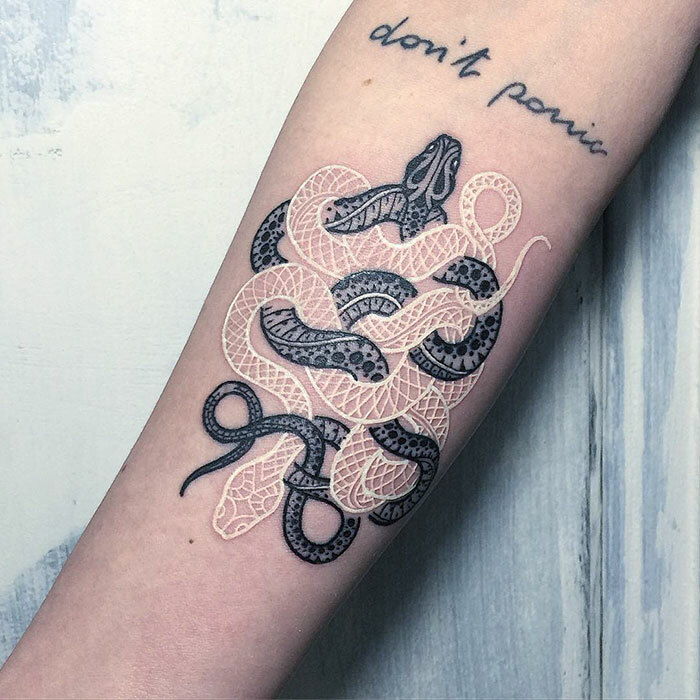 These standout themes represent some of the most visually striking, imaginative and artistically challenging styles gaining popularity in recent years. 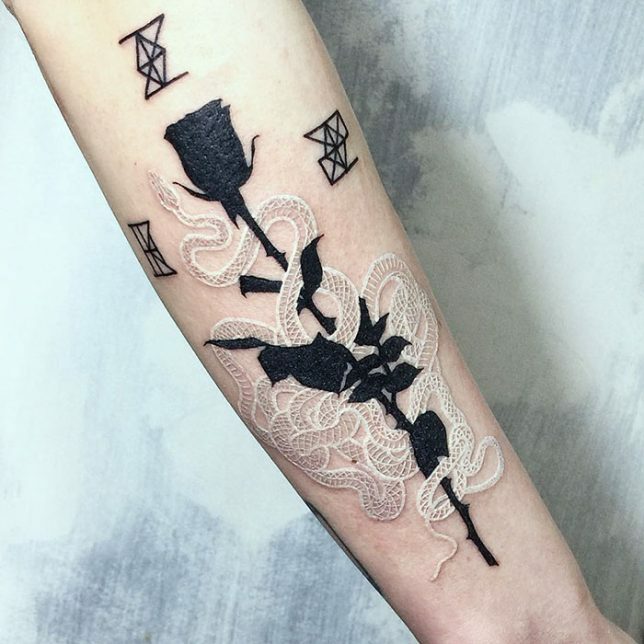 Alone, white ink isn’t the greatest choice for a tattoo, according to many artists: it looks splotchy and uneven on all but the clearest, most evenly pale skin, fades quickly, and has a tendency to disappear into a blurry mess within a short period of time. 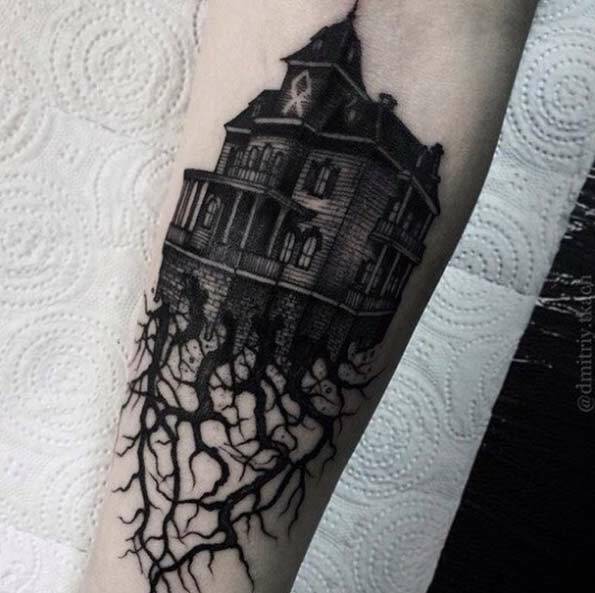 But if you’re willing to get it touched up often to maintain it, it can be really beautiful, and it sets off black ink beautifully. 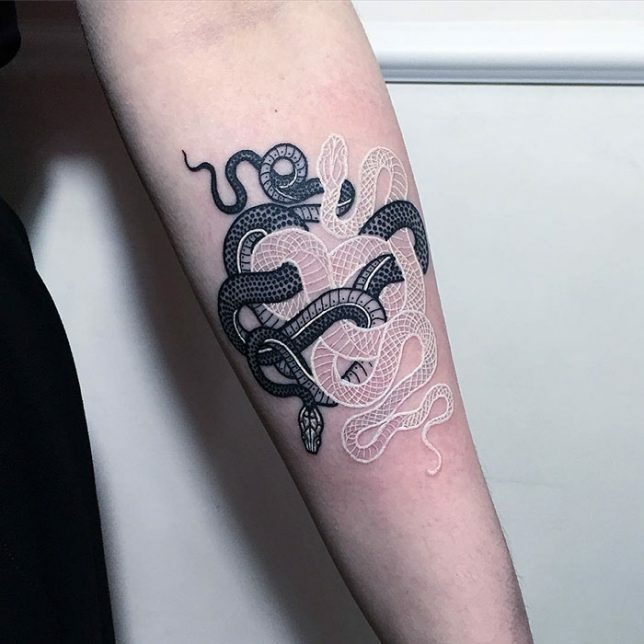 Take the work of artist Mirko Sata for example – whose most common subjects are intertwined snakes. 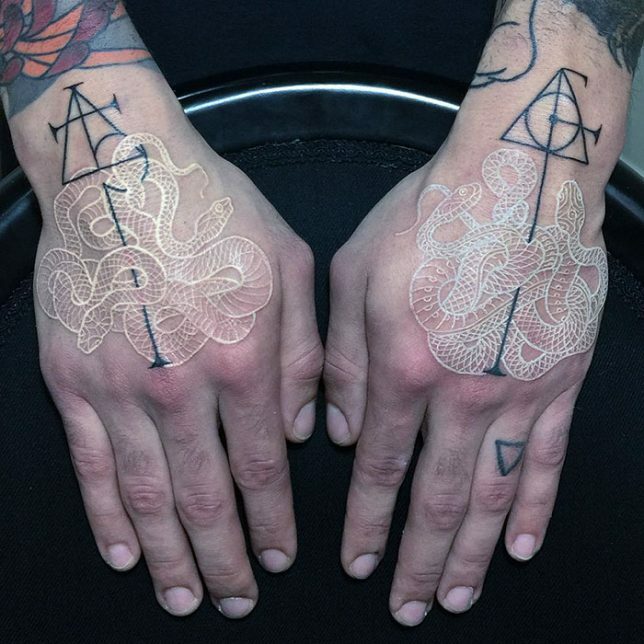 What do you do when you’ve got a large number of old tattoos you want to get rid of? 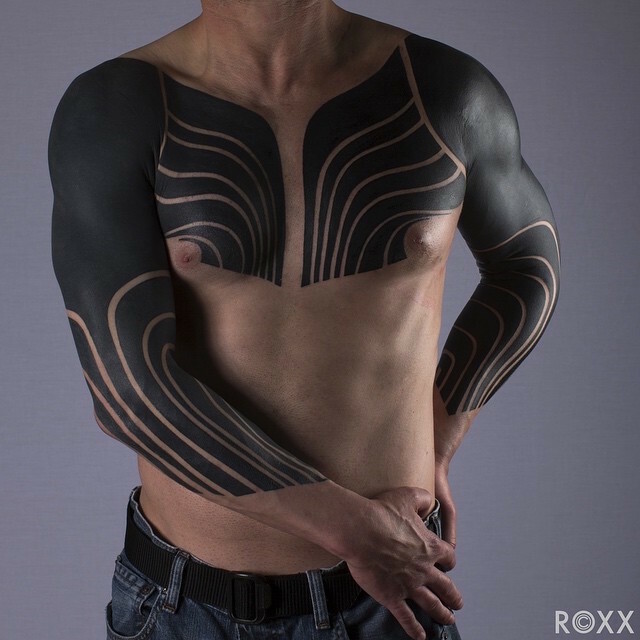 Laser surgery is an option for the removal of smaller tattoos, but some people get beyond that whole ‘permanent’ aspect of inking the skin in a different way. 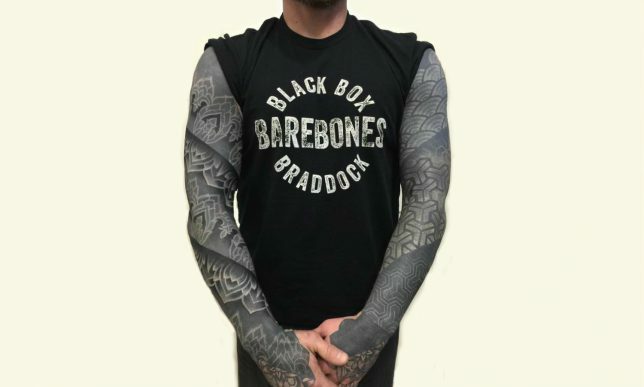 Blackout tattoos are growing increasingly popular, blocking out large areas of the body with solid swaths of black ink. 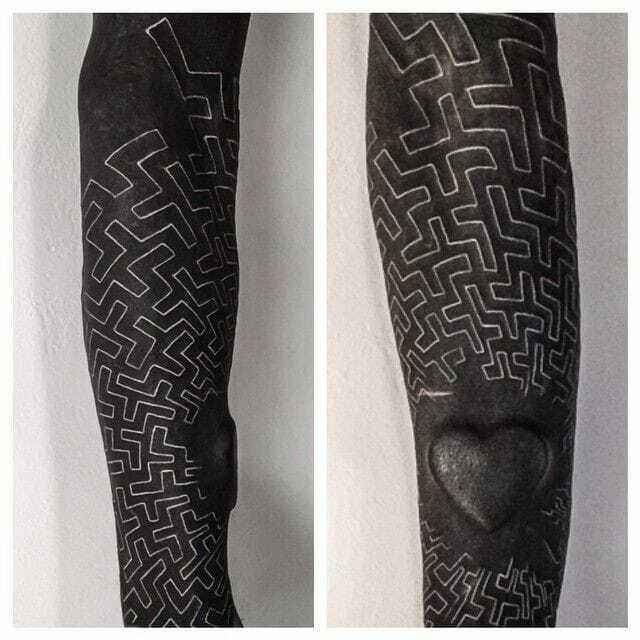 Though the lines from the old tattoo still tend to show through, and several painful sessions are often required, the look can be pretty incredible. 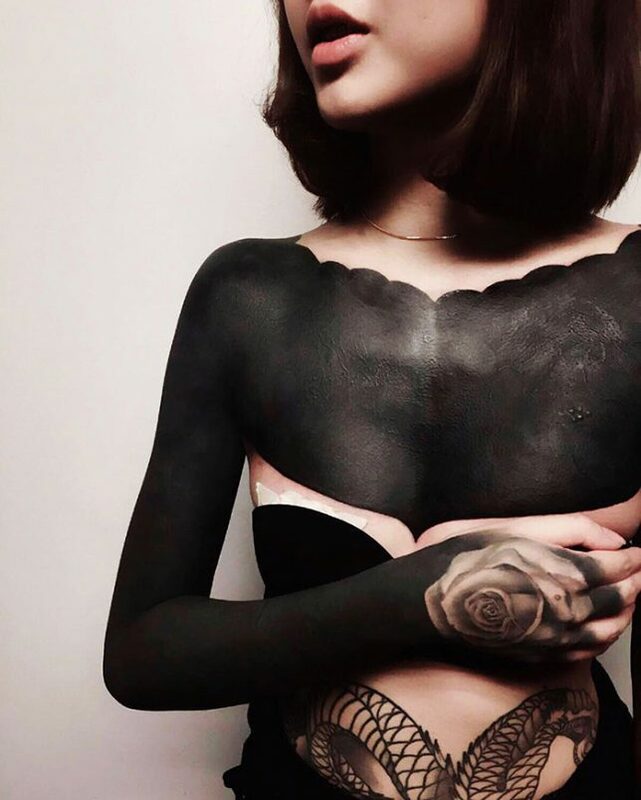 Some people get blackout tattoos on virgin skin just for the dramatic effect. 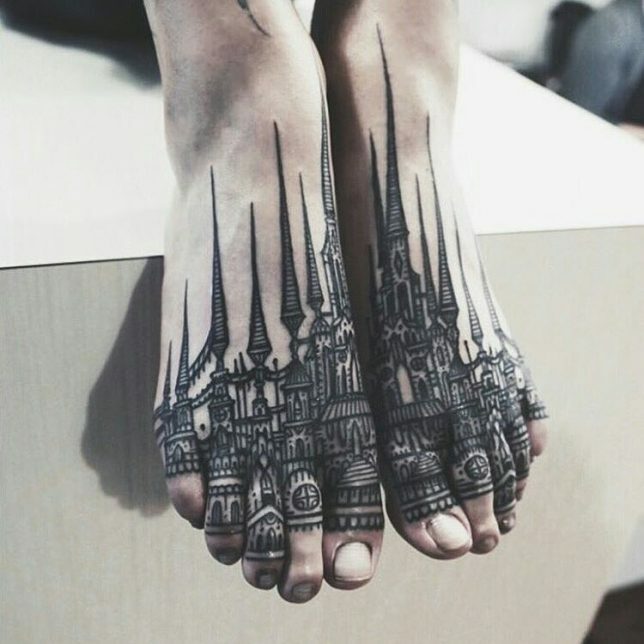 Tattooers working in this style include Chester Lee of Oddtattooer, Alex Arnautov, Simon Mora, Josh Stephens and Kenji Alucky. 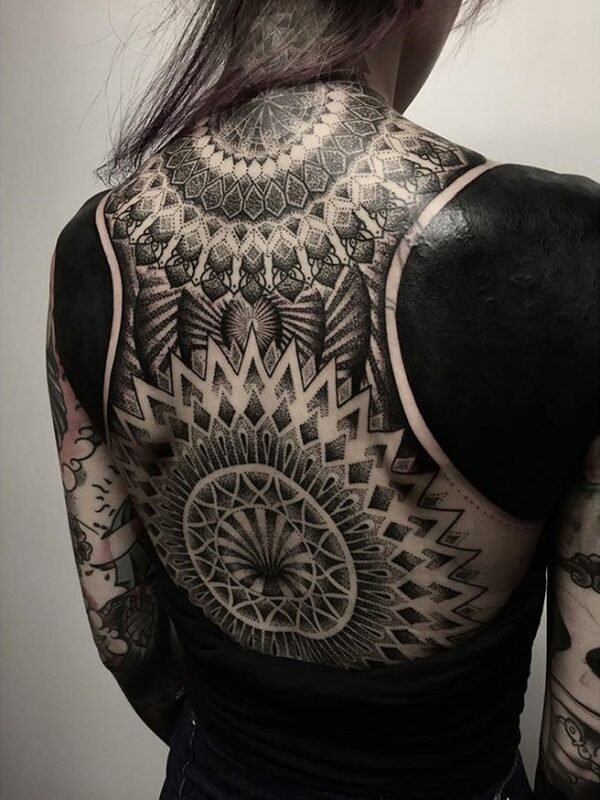 Fresh white ink applied over healed blackwork can also be a fun way to cover up old mistakes, and the contrast is pretty incredible right after it’s applied. 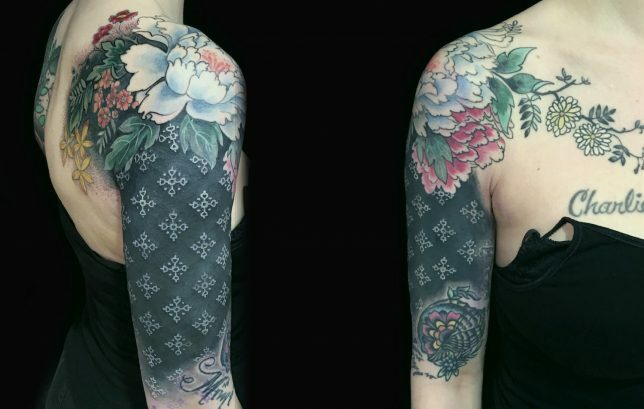 Subjects have to sit for as many as five sessions to go over the white ink to make it opaque enough to stand out, and it can take years to finish a single piece. 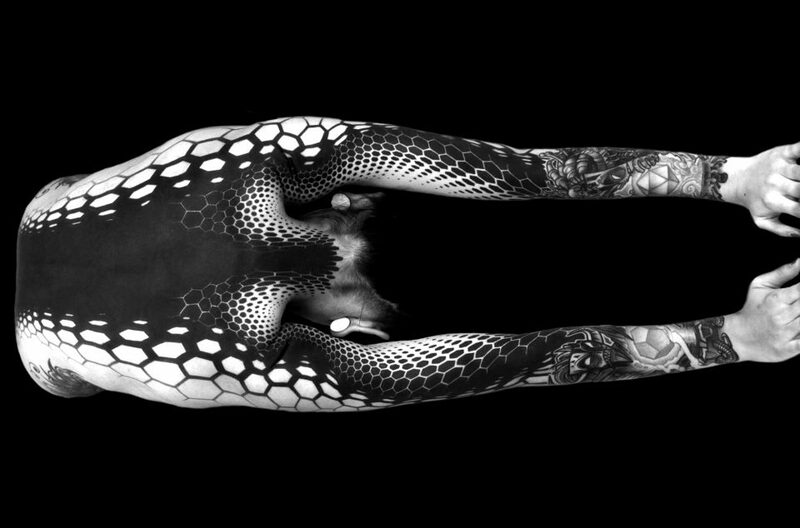 Artists who have experimented with this process include Esther Garcia, Nathan Mould, Ruslan Batyrbaev and Wayne Fredrickson. 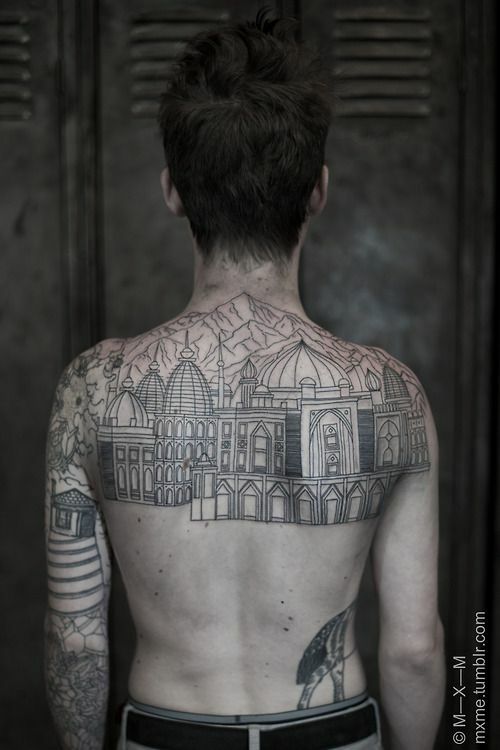 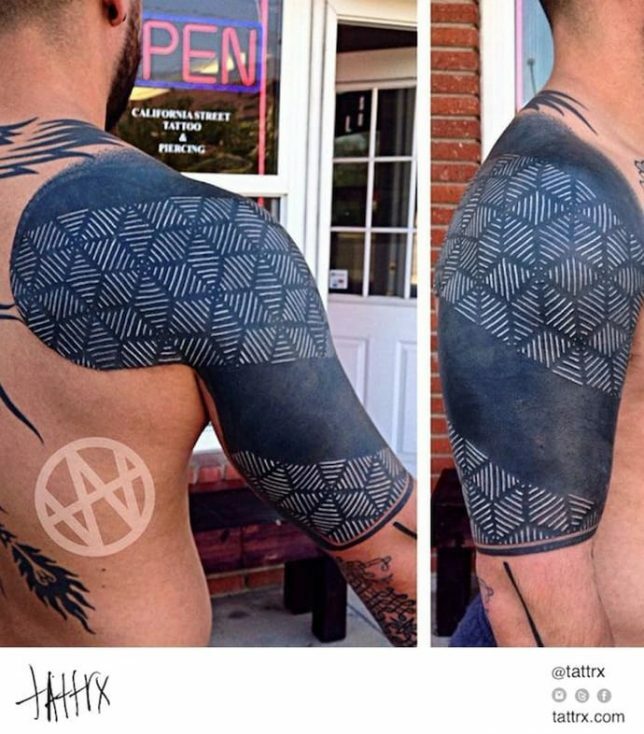 Architecture can be a particularly striking tattoo theme, especially when it takes up large areas of the body. 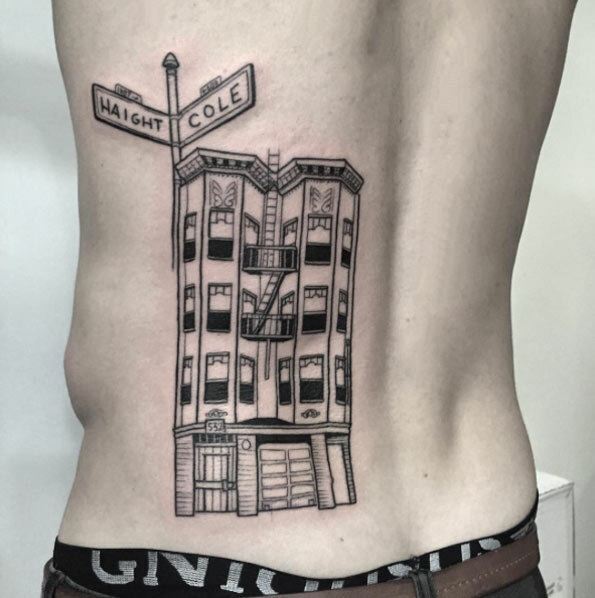 Artist Maxime Buchi of M-X-M has tattooed traditional Russian architecture across people’s backs, arms, legs and chests, and someone loved Haight Ashbury enough to get imagery of the famous San Francisco intersection inked onto their body by the tattoo studio of the same name. 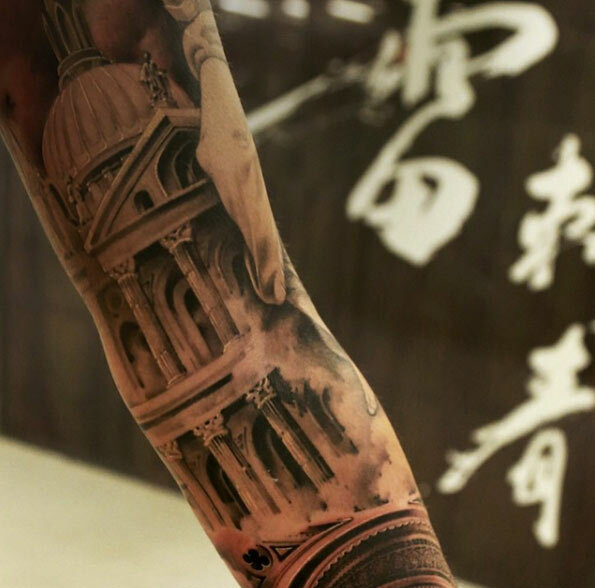 Dmitriy Tkach depicted a Victorian house with roots wrenched from the ground like a plant, while Wang Lei designed an intricately shaded classical church. 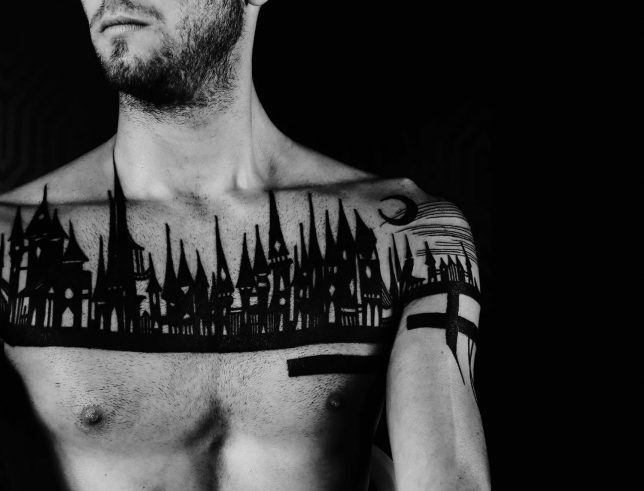 Thieves of Tower, appropriately enough, often tattoos spindly towers onto their subjects.